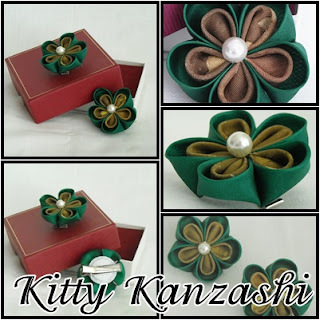 For the past two years I have been purchasing vintage kimono fabric because I thought they would make perfect kanzashi. However it has only been recently that I have decided to actually use the fabric. 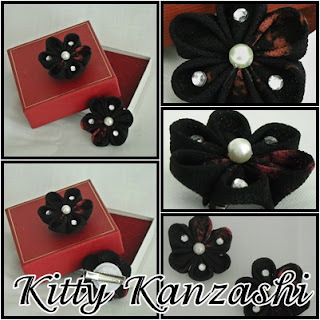 So today I have listed three new kanzashi! First one is called Midnight Sparkle. It was so hard to capture the true colour of this kanzashi because it was a dark blue/purple silk with hints of red but I think the pictures does it justice. 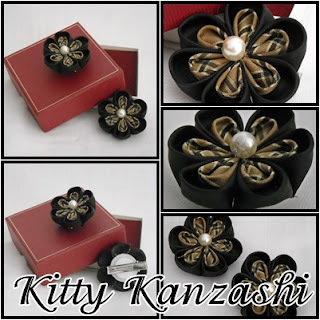 There is even a little bit of sparkle to give your kanzashi something to shout about. Second one is called Checkered Past. This used a lovely checkered piece of kimono which I wish I owned because I lack a nice beige kimono. It is set against black petals so you can see the true beauty of the fabric. And thirdly, we have Mother Nature. Using as dusky green/brown kimono fabric, it just shouts Mother Nature so adding a bit more green just helps the whole piece. Beautiful! What season would you wear these colours in ? Or aren't they related to any season ? These ones are not related to any season. They are just pretty little things that you wear.